Ms. Dinard is a Germantown senior homeowner who works 55-60 hours a week at two jobs and has few frills in her life. She does not own a car, has the minimum cable connection, and is very judicious about the use of her cell phone. She is proud that she receives no state or city assistance. However, Ms. Dinard had a problem. Despite her two jobs, she had no residual income to take care of her leaky roof or crumbling foundation. These expensive repair jobs were making her house increasingly unlivable. 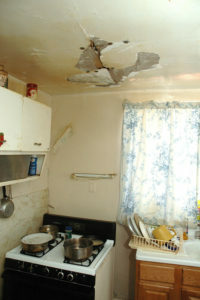 To make sure Ms. Dinard could stay in her home, URDC provided a grant to repair both the roof and point the foundation. She insisted that she wanted to contribute to the repair expenses so Ms. Dinard saved a small amount from every check for 10 weeks to help defray some of the cost. 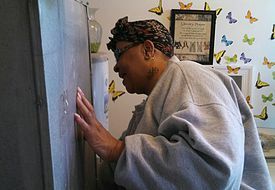 URDC also enrolled Ms. Dinard in the weatherization program that URDC ran in conjunction with Habitat for Humanity. Habitat provided an energy audit for her as well as repairs to make the house more energy efficient. On the day of the weatherization work, Ms. Dinard “rolled up her sleeves” and worked alongside Habitat volunteers as they caulked windows and doors, and waterproofed the basement. Shortly after the weatherization work was completed, a volunteer work crew from Germantown Mennonite Church repaired and painted Ms. Dinard’s walls and ceilings that were damaged by the leaking roof. She again worked with the volunteers and helped with the painting. Within 12 weeks of contacting URDC, Ms. Dinard’s roof was repaired, her foundation pointed, her home weatherized, and the walls repaired and painted. As a senior homeowner, she is now able to age in place safely and securely.